There’s nothing worse than having dry skin throughout the colder months. While this isn’t typically an issue through summer, once it starts to get cold your skin can dry up. This leaves you to trawl through hundreds of moisturizers in the hopes of finding the perfect product that’s going to match your skin’s needs. There’s no need to do this if you know what the best brands are. Plus, our list of the top 10 best drugstore moisturizer brands won’t break the bank. Why are These the 10 Best Drugstore Moisturizer Brands? 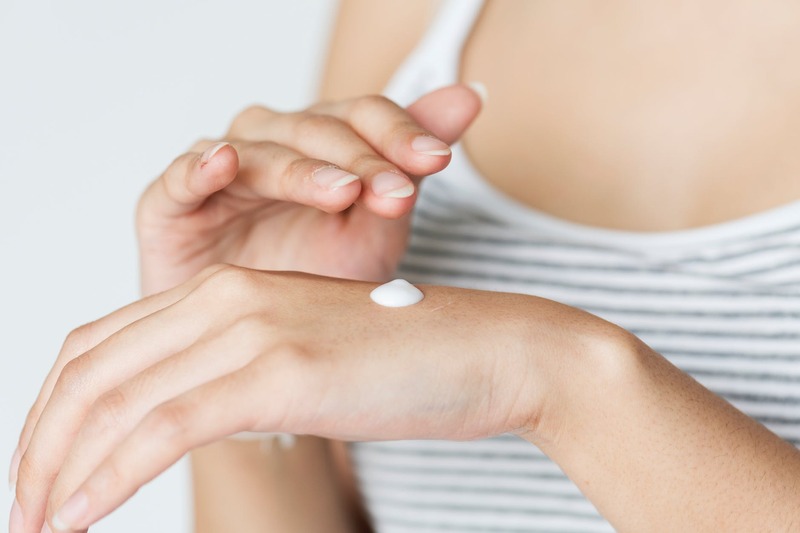 Our comprehensive list of the best drugstore moisturizer brands has been created as a result of in-depth research, along with comparing and contrasting. Each drugstore moisturizer will be described in detail, listing the various features it may have. We will conclude our review of each moisturizer by giving it a star rating out of five. Without further ado, let’s take a look at our list of the top 10 best drugstore moisturizer brands that won’t let you down in price, or quality. The first drugstore moisturizer on our list is a tried and tested brand that’s been around for years. It’s hard to beat a product that’s been trusted by customers for decades – however, it does have its downsides. 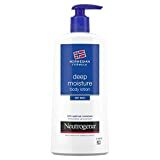 The Norwegian Formula of Neutrogena’s skincare line is specially designed to be effective on dry skin. While it has a thick and creamy consistency, it can still easily penetrate your skin for proper hydration. This drugstore moisturizer has a faint fragrance that won’t be offensive if you’re sensitive to smell. Its subtle and lasts for a while, keeping you smelling fresh. We love this drugstore moisturizer because it makes your skin feel smooth and supple throughout the day. It’s also great because it can be used for a good hand cream, as well – not all moisturizers can double up like this. It has a non-greasy formula. However, it can sometimes feel greasy if you have normal skin. The next drugstore moisturizer on our list is another favorite that has been a bestseller for a long time now. We also love this particular brand and moisturizer because it caters to a whole range of different skin types. 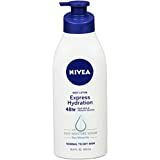 The Nivea Express Hydration Lotion is designed explicitly for dry skin. 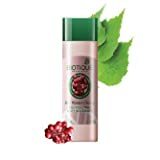 However, the texture of this moisturizer is non-greasy and completely smooth, which means that even people who have normal skin can use it regularly. The Nivea Express moisturizing formula contains Hydra IQ and sea minerals. These ingredients penetrate deep down into the skin for a smooth, hydrated feeling that you’ll experience all day long. This drugstore moisturizer is also great when used in warm and humid conditions. The Nivea Express Hydration Lotion contains natural minerals which are a plus and helps to improve the overall health of your skin. Having a moisturizer that does the job well is good. Having a moisturizer that does the job well naturally is even better. 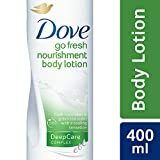 Dove Nourishment Fresh Body Lotion is a drugstore moisturizer that uses natural ingredients in its formula. It’s made from amino acids, sunflower seed oil, and glycerol. All these ingredients work to nourish your skin and repair its overall condition. While it does these things, it also keeps your skin nice and hydrated. Other ingredients include cucumber and tea tree oil. Cucumber is known to be a powerhouse of hydration, while tea tree oil has a soothing effect on your skin. This drugstore moisturizer is made from patented skin nutrient technology. This helps to replenish the moisture levels of your skin as soon as you rub it in and maintains these levels throughout the day. The next drugstore moisturizer on our list also has natural derivatives, making it better for you and your skin. 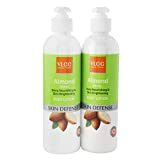 The VLCC Almond Moisturizing Nourishing Lotion has an extensive list of ingredients that fall within the natural category. These include wheat germ, fenugreek, almond oil and aloe vera. All of these ingredients work together to nourish your skin on a deep level. What we love most about the VLCC Almond Moisturizing Nourishing Lotion is that its’ also SPF 15. There aren’t too many other moisturizing lotions that have included UV protection as well, so this makes it unique. SPF 15 works well in a moisturizer because it helps to prevent your skin from aging prematurely. It also gives the moisturizer a chance to repair any sun damage your skin has already developed. VLCC Almond Nourishing Moisturizer can also help with any skin darkening issues caused by dryness. The beauty of our next drugstore moisturizer is that it delivers on results, despite not having the fancy ingredients that many other higher-end brands include. St. Ives Hydrating Daily Vitamin E Body Lotion, as its name suggests, contains vitamin E. Vitamin E plays a vital role in the repairing and restoration of dry skin. It works by deeply conditioning through the superficial layers. Avocado is included in the list of ingredients for this drugstore moisturizer. Avocado is exceptionally effective at providing your skin with natural hydration. The glycerin that’s included in this drugstore moisturizer is plant-based, which is a lot safer for both you and the environment. Another win for the St. Ives Daily Hydrating Body Lotion is that it is free from any parabens. Dermatologists even recommend this understated drugstore moisturizer. As if all these factors weren't enough, it also has a great smell. 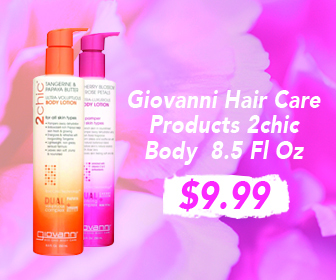 provide a glowing, smooth complexion and reveal fresh skin. If you’re someone who is serious about buying products that are both natural and cruelty-free, you won’t want to go past the next drugstore moisturizer on our list. The Lotus Herbals Renewal Skin Moisturizer is an excellent choice if you’re looking for a natural moisturizer that doesn’t test on animals. This drugstore moisturizer contains grape extract which is an astringent, naturally. The thing we love most about the Lotus Herbals drugstore moisturizer is that it’s also anti-bacterial. This means that it can soothe any irritation you may be experiencing from having dry skin. The milk enzymes in this drugstore moisturizer help to rejuvenate and nourish your skin. Aloe vera is another ingredient that helps to soothe, heal and keep your skin from drying out further. This may be our favorite body lotion when it comes to its antioxidants and being anti-bacterial. If you’re a big fan of essential oils and their healing properties, then you’re going to love the next drugstore moisturizer on the list. In fact, the oils that are found in the Biotique Bio Winter Body Lotion are known to be some of the best for rejuvenating dry skin. The ingredient list includes Helianthus annuus oil, Brassica nigra oil, and Badam tail. While you may not have heard of any of these oils, the proof is in the product. They have shown to be incredibly useful when it comes to nourishing and moisturizing your skin like no other. One thing that we would say about this drugstore moisturizer is that it’s quite a bit thicker than other products. It also has quite a distinctive smell, because of the high concentration of herbs. If you’re sensitive to smell, you may want to steer clear of this one. Despite this, though, it works wonders on your skin and hangs around for more than 12 hours. You may already be familiar with the luxurious feel of shea and cocoa butter on your skin. They're both favorite ingredients in body lotions, so the chances are that you've used them before. 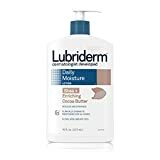 The Lubriderm Daily Moisture drugstore moisturizer is not only a luxurious cocoa butter formula, but dermatologists approve it for hydrating your dry skin. Both of these natural butters are loaded with nutrients. These nutrients can adequately take care of all your dry skin needs like hydration, nourishment, and moisturization. This drugstore moisturizer is non-greasy and will leave only a faint fragrance on your skin, so it’s a great option if you’re sensitive to smell. It will keep your skin nice and moisturized for the entire day. While it's fun to try out all the different styles and flavors of body lotion, sometimes what you really need is a simple, no-fuss formula that puts all its focus into repairing your damaged skin. 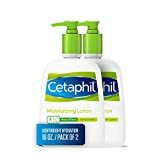 Cetaphil Moisturizing Lotion is a no-frills drugstore moisturizer. It's recommended by dermatologists, and while it may not be anything to look at, it certainly gets the job done. In fact, it’s so effective at dealing with dry skin issues that it’s safe to use on children as well. This means that it can treat bumps, patches, cracks and chronically dry skin. What we love most about this drugstore moisturizer is that it's light on application, smooth and incredibly moisturizing. It helps to lock water into the upper layers of your skin while helping to prevent moisture loss as well. You may have already tried and tested many different cocoa butter types – but how many were the perfect combination of butter and natural oils? Himalaya Herbals Cocoa Butter brings you cocoa butter – with a twist. Among the ingredients are olive and grapeseed oils, as well as wheat germ. These three natural additions mix together with the cocoa butter to produce a powerhouse moisturizer. This drugstore moisturizer is effective at soothing and softening dry, itchy skin. Investing in just one bottle of this will get you through all of winter. We love this drugstore moisturizer because you can apply it to damp skin, so it’s perfect for massaging in after a shower. The cream itself spreads easily and absorbs before you know it. There’s a lot to be said for a great quality product that isn’t going to set you back too much. Just because you have dry skin doesn’t mean you have to go straight to the top tier of body lotions and spend hundreds of dollars. While the high-end brands may look tempting, in reality, they're no better than some of the drugstore alternatives. With our extensive list of the top 10 best drugstore moisturizers, you’re bound to find one that will do wonders to your skin.